In just 22 days, I’ll be running somewhere in the Massanutten Mountain range, attempting my first 100 mile ultramarathon. It seems like a lifetime ago that I first set this goal and announced it on the blog. But here we are, 22 days out, and everything is starting to come together. 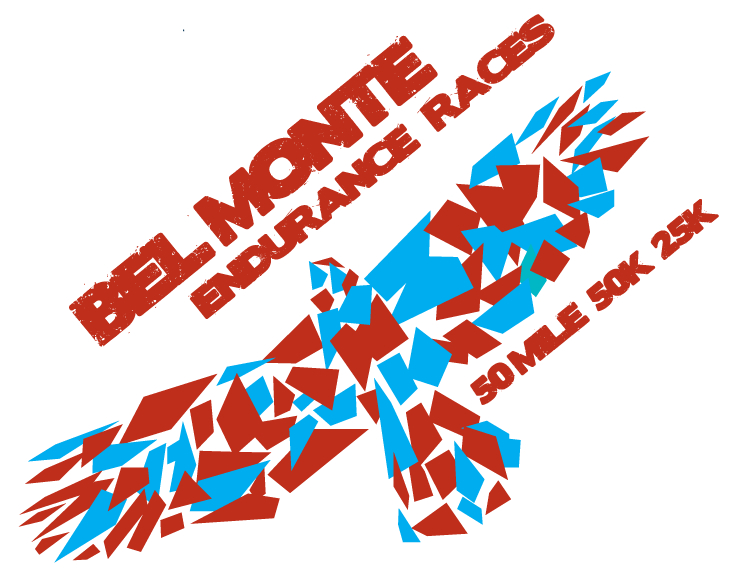 This past weekend I ran the Bel Monte Endurance Races 50 miler, my last major long run before the goal race. Sure, I’ll log a few more outings in the mid- to high-teens, but this 50 miler was my last real chance to test gear, nutrition, and most importantly my mind and body. This result of race this race would send me to the starting line of the Massanutten Mountain Trail 100 (MMT100) feeling good or feeling terrified. I’m going to do something a little different today, and instead of giving you a full race report or a long list of lessons learned, I want to touch on a number of reflections from the Bel Monte experience. Lessons that I’m sure ultrarunners can relate and learn from, but I think will also apply to any runner. But before I dive into those reflections, I can’t post a race report without at least touching a bit on the race itself. To put it simply, the race is incredible. It’s on an incredible course, with incredible mountain views, incredibly difficult sections, and incredible amounts of rocks. It’s also incredibly well run by the team at Bad to the Bone, who kept everything running smooth and easy, with well-stocked aid stations and great course markings. This was easily the most difficult ultramarathon course I’ve run, which is exactly what I was going for. The out-and-back course has around 6,500 feet of elevation gain, and two 9.5 mile sections (the same one, twice) between aid stations, featuring a few thousand feet of elevation change in that section alone. It’ll test anyone’s ability, so it’s no wonder it took me 2 hours longer to run than any of my other 50s. My father followed me around all day, helping out at aid stations and providing words of encouragement, and even though it took me so much longer to finish than previous races, I still feel good about how I ran. 1) No matter how much trial is done, keep testing out new nutrition techniques. When it comes to nutrition, I’ve done a lot of in-run trial and error. I like to think I’ve got a good grasp on what my body handles, and when I should be consuming it. I know I can consume an energy gel every 45 minutes. Until I can’t any longer. Usually somewhere around the 8 or 9 hour mark. I know PB&J tastes great at any point during a race, and that I can continue without cramps after downing one. I know I shouldn’t drink Coke until the last 1/4th of the race, or I’ll start to crash too early. And I know that water is the easiest liquid for me to consume. But I also know that inevitably I’m going to have some sort of stomach issue, and I haven’t figured out a guaranteed way to handle those issues. I also know that if I’m going to make it through 100 miles, I’ll need to consume some calories in liquid form, something I hadn’t done much of in the past because water was so much easier to ingest. That’s why continuing to try new things during training and training races like this one is important. No matter how experienced you think you might be. During this race I tried two different sports drinks packed with calories and electrolytes. I also played around with how often and how much I could drink. And I played around with what to eat once the stomach started to revolt. This time around mile 34. 2) Gear doesn’t always act the way you want it to. My main piece of gear for the past several months of training has been the Ultimate Direction AK Race Vest, which I’ve been praising since the first time I wore it. But for some reason, about 12 miles into this past weekend’s race, I noticed that it was irritating a small patch of skin on my neck. Something it hasn’t done before. You never know if it’s what you’re wearing, the way the gear is wearing out, or how the weather and terrain affect how a piece of gear rides, but no matter how much you’ve used something before, it can always act differently on game day. Which was a nice reminder to always be prepared. For the MMT100 I’m now planning to have two pack options, which I can switch between if one is giving me a hard time. I’ll also have back-up hand held bottles to use when I need or want them. The other thing I’ll be taking away from Bel Monte is to make my gear list well before I start packing. I forgot a few things when quickly throwing everything in to my pack for the race. A true rookie mistake. I plan to make the MMT100 gear list next week, and check it every few days to make sure I didn’t leave anything off. That way I’ll know it’s ready when I actually start packing. Put in a lot of miles. The MMT100 course is littered with big climbs and descents, and well, it’s 100 miles, so both of those seem really important. While living in DC I focused on the mileage. Now that I’m minutes away from mountain climbs in NC, my focus has turned to that. Bel Monte was a true test of how my training has been going, and what I still need to work on. Somewhere around mile 44 you hit a 1 mile, 1000 foot climb over a ridge. That far into the race, the strength left in your climbing legs is everything, and while I made it up the mountain and over the pass feeling strong, it didn’t taking long into the decent for me to realize what a toll that took on my legs. I was in pain, and dancing down the hill as lightly as I could. You don’t want to find your weakness during the main event, so I’m glad I ran a course that challenged me in new ways. And for the next two weeks, I’m going to focus almost entirely on putting in as many up and down hours as I can. Mileage is important, but for me right now, elevation will be everything. We never stop learning and getting better. This was a different type of race for me. I’ve never run a race anywhere near the 50 mile distance and not had it be my end goal. As a result, I was left feeling a little disappointed at the finish line. Not because I didn’t think I did well, but because I couldn’t really justify the typical celebration. More work is left to do. But the point of running Bel Monte wasn’t to celebrate the achievement. It was to test my training, and continue to learn in preparation for something else. And that’s exactly what I’m taking away from the Bel Monte Endurance 50 miler. Endurance running challenges your mind and body in different ways every time you push it. And with each challenge, you’ll learn something new. I learned a lot from this race, lessons I’m so glad I learned before toeing the Massanutten line in 22 days. If you’re thinking about going from half or full marathon to ultramarathon this summer, check out my recently released training system Discover Your Ultramarathon. The first batch of people using the training system are running their races now, and the response has been incredible. You don’t have to be a superhuman to run an ultra. I’m certainly not. You just need to know where to start. Click here to check out the Discover Your Ultramarathon training system to learn just that. As a side note, it just so happens that one of the interviews included in the system happens to be the race director of Bel Monte! Congrats on finishing the Bel Monte, this was my first 50 miler and it was quite an experience to say the least. I made it in just a couple minutes under the 13 hour cutoff (although it was cool they let people finish after that time). That 9+ mile climb to the 50 mile turnaround and back was something else. It’s very encouraging to hear it took you a couple hours longer than your other 50s, gives me hope if I do another 50 miler there’s always room for improvement depending on the course. Thanks for the recap and good luck on your 100 miler! Congrats on your first 50! You picked a tough one, which is awesome. In my opinion the 13 hour cut-off is a little aggressive for that course, but I’m sure they do that in part for safety reasons. Great work out there, and I look forward to hearing about any future ultras you run! Thanks for reading. Awesome job, I too did the bel monte 50 as my last long run before MMT100 (it will also be my first 100 also, extremely nervous!) I agree about the uphill, I’ve focused less on mileage and more on how much uphill I can get in a run or hike and how much time I’m on my feet. My stomach also always goes bonkers during these things, have you tried the chicken noodle soup? That stuff saved me at Bel monte!